Your irrelevant newsflash of the day: I’m keeping my personal Facebook account. Just so you know. This was a grand decision. I’d about made up my mind to deactivate, as some of you are aware, and then I reconsidered. Like many of you, I had more than one foot out the door; I’d stepped almost all the way out the door, leaving just my shadow in Facebook. In my opinion, Facebook has become absurd on many levels. I was relieved to have decided to part ways with it… but that would have meant parting ways with everyone. Conundrum: FB is the only way I can stay connected to many friends and most family. Connections won. I see friends and family too seldom as it is… I’d miss them more were I to abandon my digital hub of connections. Still, I have mixed feelings about this. The poet Miss Dickinson comes to mind: in her later years, she reportedly never left her house, rarely left her bedroom, and spoke to visitors only from behind her closed door. Even more than living as a recluse, she seldom saw anyone. This could be me at some point, only my closed door would be a computer screen. It seems that the digital age has encouraged our inclinations toward complacency in solitude, because we don’t feel as alone when we’re linked to each other online. One could say that the reason Emily Dickinson didn’t feel “hungry” was that she stayed inside. She shielded herself from wanting. Physical isolation was her comfort. She did have her liaisons, though. She kept up an active correspondence with many, writing hundreds of letters and poems over the course of years. Miss Dickinson was ahead of her time in more ways than one. She stayed connected through her letters and poems the way we stay connected through the internet. I’m content to sit at home, alone and writing, most of the day and on most days… but I don’t want to be isolated. I enjoy the physical company of others – and not just at the gym! So I’ve been making more plans to have lunch or coffee with friends. I have some time, now, after all. At any rate, I’m not sure how this post deviated from “I’m keeping my personal Facebook account” to a reflection on the habits of reclusive poets. To leave you with an almost as-irrelevant finish: I resisted the urge to fill this post with an exuberance of dashes in further homage to Miss Dickinson. Just so you know. Do you have a Pilea? I’ve become obsessed with them and they are so easy to propagate. I recently reactivated FB to join some grad school groups and still loathe FB as a whole. Still glad to see your posts though! Thank you, Angie! 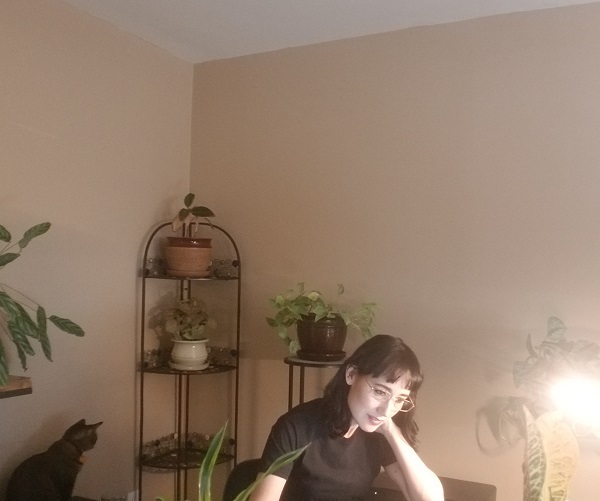 =) My office is my sanctuary, and that has everything to do with my plant collection. The air in here truly feels cooler and fresher than anywhere else in the house. No, I don’t have a Pilea. They look enchanting… now I’ve got it in my mind to seek one out. FB is infuriating like that, right? We sort of rely on it while we detest it. Ugh. Thank you! I’m glad you enjoy my posts. I love your pics on insta.